Sammy Andrzejaczek grew up ocean obsessed in Western Australia and knew from an early age she wanted to be a marine biologist. She completed her Bachelor of Science Degree in Queensland and developed a fascination with all things shark. Her Honours thesis on whale sharks fed that fascination and she has now moved onto a PhD where she is looking at the vertical movements of sharks and other pelagic predatory fishes. She hopes her project on tiger sharks will become the cornerstone of her thesis and enable her to compare findings with other species of shark around the world. In her (limited) spare time she can be found outside – surfing, diving, camping and hiking. She also loves martial arts and is a black belt in Zen Do Kai. We live in the age of computers and information. While technology advances, the devices we use are getting smaller and more compact, and we are able to carry a world of information in our pockets. The same can be said for animal-borne tagging devices. Tags no longer just record where an animal is going; rather they are capable of telling us how an animal is moving, measure the physical environment that the animal passes through and record the physiological state of the animal as it undergoes movement. Some tags even have embedded video cameras that effectively carry us along for the ride as animals go about their daily behaviours. These advances in tagging technology offer a huge potential for researchers to gain an understanding of drivers behind movement patterns, i.e. not just where an animal goes, but how it moves and why it moves to get to a particular destination. For sharks – my study species – most movement research to date has largely focused on horizontal scales i.e. movements across ocean basins or along coastlines. However, marine animals live in a three dimensional environment, moving up and down through the water column as well as across it. It is fair to say that unless we understand how and why animals move in these three dimensions, then we have little chance of getting a real insight into their ecology. Manuel Dureuil is a Ph.D. candidate whose research focuses on the conservation ecology of sharks. He did both, his Bachelor and Master thesis, in the field of shark conservation at the University of Marburg and Kiel in Germany. His main interest are spatial ecology and data-limited assessment approaches to form a scientific basis for a more comprehensive protection of sharks. A species with particular focus of his research is the Atlantic weasel shark, which is only found in West Africa. Sharks in this area are among the least researched yet most threatened by illegal and unregulated fishing. The weasel shark fulfills all criteria to be considered data-limited: there is no population assessment, no information on its spatial ecology and almost no information on its biology. Manuel is raising funds till the 9th of July as part of The Experiment’s Sharks Grant Challenge, to start a weasel shark project in Cabo Verde, West Africa. Using the weasel shark as an umbrella species the researchers also hope to create awareness for sharks in this region in general, on a national and international level. The remote island nation of Cabo Verde holds one of the last remaining hotspots for sharks in the entire North Atlantic Ocean and therefore could offer some degree of protection from the ongoing decline in shark populations. This is particularly important for locally endemic species which only occur in this area, such as the Atlantic weasel shark. We know almost nothing about this species and accordingly it is listed as ‘data deficient’ on the IUCN Red List. However, the little we know suggest that this shark is vulnerable to overfishing, making the protection of important habitats (such as nursery grounds) crucial for healthy populations and preventing extinction. Dr. Glenn R. Parsons is a 30 year veteran in the battle against University Administrators, bean-counting bureaucrats, and disinterested students (i.e. he is a Professor at Ole Miss). In his spare time he conducts research work on fish physiology and ecology and has published many papers on shark biology, primarily Gulf of Mexico species. He is author of the seminal book on sharks of the Gulf of Mexico entitled “Sharks, Skates and Rays of the Gulf of Mexico” and a popular novel entitled “Cherokee Summer” that could have been on the New York Times best seller list (if only it was better written and was backed by a high-powered agent like John Grisham’s). He received his PhD from the University of South Florida, School of Marine Science, MS from the University of South Alabama and BS from the University of Alabama. He was a DISL Marine Research Fellow, a Gulf Research Council Research Fellow, and a winner of a World Wildlife Fund, Smartgear Competition (for his bycatch research). Folks, The world has witnessed an unparalleled decline in sharks that began about 30 years ago and has continued to the present. While the explanations for this decline are varied, scientists are in agreement that “bycatch” during fishing is one of the problems. Bycatch is the un-intended capture of non-target species during fishing. For example, commercial fishing for tuna and swordfish results in the capture of many sharks. The World Wildlife Fund estimates that 50,000,000 sharks are taken as bycatch during commercial fishing. Unfortunately, many of these sharks do not survive the stress of capture (a topic that my lab has researched for many years). Fishers do not want these sharks (they are dangerous to handle and they damage fishing gear) and they would welcome new developments that would reduce or eliminate shark capture. Help crowdfund shark research! Always chew your food – how freshwater stingrays gnaw on prey. Matt Kolmann is a PhD candidate whose research program is at the interface of evolution, comparative anatomy, and biomechanics. He completed his Master’s degree at Florida State University with Dr. Dean Grubbs on the feeding biomechanics and fisheries ecology of cownose rays, a purported pest on commercial shellfish. During this process he developed a love of field work, and since then has collected rays and other fishes on expeditions across South and Central America with the Royal Ontario Museum. His PhD research investigates the evolution of biodiversity using South American freshwater stingrays as a model system. The number of different feeding niches these stingrays occupy is astounding, and Matt is using gene-sequencing, comparative phylogenetic methods, and biomechanical modeling to characterize the evolutionary processes underlying this biodiversity. From June 8th through the end of Shark Week, he will be raising funds to delve more deeply into the evolution of feeding behavior in freshwater rays – specifically investigating whether freshwater rays ‘chew’ tough prey like insects in a manner comparable to mammals. Follow him on twitter! What role does our food have in explaining where we live, what we look like, and how we behave? I study how properties of prey – material, structural, and ecological – shape the evolution of predators. Specifically, I am interested in how animals adapt to novel foods and diets that pose unique challenges: prey that are tough, stiff, hard, or just generally robust. I approach these questions at the macroevolutionary (how species are related) level; biodiversity lends insight into engineering and synthetic design based on an understanding of how animals evolve using similar organic principles. Bryan Keller just graduated with his M.Sc. from Coastal Carolina University. 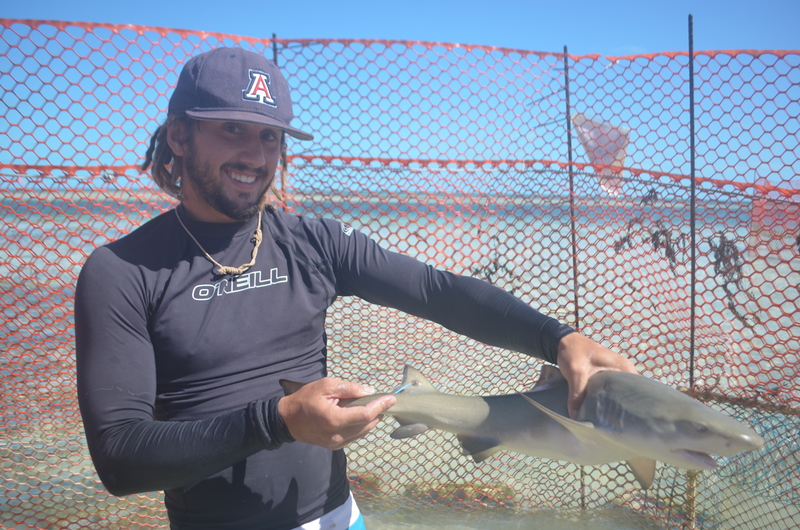 For his thesis, he investigated the effect of familiarity on the social preferences of lemon sharks while researching at the Bimini Biological Field Station. Bryan and his team showed that lemon sharks do indeed prefer familiar individuals. Imagine this: You have two classes of kindergarten students that remained separated for one school year, and at the end of the year, the classes are mixed. More often than not, students would choose ‘friends’ based upon whom they are most familiar with, in this case that would be their classmates. Lemon sharks are the same way, they showed a preference for their ‘classmates’. Offshore wind farms offer countless benefits, but will there be environmental costs? To help answer the looming question, we will tag a population of bonnethead sharks in South Carolina. The tags will communicate with acoustic receivers, and when the sharks swim close enough to the receiver, its presence will be documented. By using a series of receivers, we will be able to determine where a shark spends most of its time. After we know where the bonnetheads are spending their time, we will be able to conduct laboratory trials to determine if the introduction of offshore wind farms can displace the shark from this area. Recent work in SC showed that bonnetheads returned to the same estuary each year and from this, we know that the sharks aren’t randomly distributed throughout the environment. What if they can’t get back to the habitat they occupy every year? If offshore wind farms disrupt the marine ecosystem and prohibit sharks from returning, then there could be serious repercussions.